Do you run contests on Facebook? Do you need better results? I’ve seen a lot of companies use Facebook contests, Facebook Sweepstakes and group offers. Some amazingly savvy small and medium businesses have used these marketing tools to succeed beyond anyone’s expectations. Others have been dismally disappointed with their results. Do you want your next Facebook contest to be a resounding success? Do you want to know how to run a sweepstakes? Here are 101 tips I’ve put together to help you achieve your Facebook contest goals. Why run a Facebook Contest? What’s the value of running a Facebook contest? 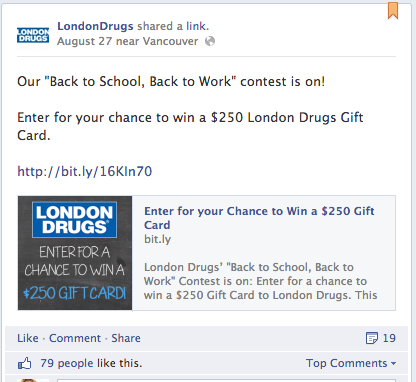 How will a contest help a business to market itself, and what else can you do with these social promotions? I get asked these questions a lot. Business owners know the importance of having a Facebook Page, but many are still learning the benefits of running Facebook contests. Any successful marketing campaign requires a bit of planning. Running a Facebook contest is no different. 11. Make goals - Write out your campaign goals. Without goals, you won’t have a direction, and it’s going to be way harder to succeed. You might have different goals for every contest you run. Know your goals before you begin. 12. Make objectives - Based on your campaign goal, make your specific, measurable, attainable, realistic and time-based (yup, SMART) objectives. If you haven’t thought about your objectives, you won’t know what results will make you a success. Write out at least 5-10 objectives, and you can measure these to get your ROI. 13. Know your target market - Who do you want to be aware of, and take part in your contest? Brainstorm the markets you want to reach. List out their demographics. This will help you to determine further details about your contest and how you promote it. Your contest will look different if you are targeting soon-to-be married men, than if you are you targeting new grandparents, for example. 14. Make personas - Take your target market analysis one step further and make up a few personas of who you want to enter your contest. Write out what a typical day in the life of your markets might look like. What technology do they use? What do they do on weekends? And more. 15. Have a budget - This kind of goes without saying. Determine the costs for your campaign - and stick within it! 16. Strategize your Facebook contest - Once you’ve got your big picture goals and target market sorted, get more detailed with a contest strategy. 17. Choose your type of Contest - You’ve already determined that you want to run your contest on Facebook, but what kind of contest best suits your goals, objectives and target market? Sweepstakes - easy to enter, supports getting more ‘likes’, email, and brand awareness. The prize is key. Vote Contests- get consumer feedback. Let your Facebook likes choose your next product line, or just have fun with increased engagement. Photo Caption Contests - ask entrants to caption a photo you choose. You can get lots of ‘likes’, emails, and engagement. Essay Contests - get more feedback from entrants, or get more brand awareness. Ask your customers to write a few words about a topic you choose (such as why your Mother is the best - for Mother’s Day). Photo Contests - gain UGC by asking entrants to submit their best photo of your product, or any other business related theme. Video Contests - take a photo contest one step further, by asking entrants to submit short videos about your product or related topic. Group Offers- easy to enter, and gives your business immediate sales with a group coupon, as well as more ‘likes’ and emails. 18. Choose a prize - Your prize is one of the most important motivators for people to enter your contest. Having a bad prize (or no prize) can make your contest flop. 19. Make your prize brand related - Your giveaway needs to be related to your business. Offer a product you sell, a gift card, or even a cool experience (such as backstage passes to a band or movie set), that markets your business too. This will entice entrants who are interested in your business, and more likely to become become customers. Don’t giveaway an iPad, for example, if it’s not at all relevant to you. 20. Make your prize motivating to enter - Choose a prize that your target market wants. If you’re marketing to environmentally friendly types, don’t give away an SUV, for example. 21. Make your prize fit with your goals (and budget) - Your giveaway needs to suit your goals, your ask from entrants, and your budget. If you want to gain UGC of product videos, you’ll likely need a bigger prize than if you are just asking contestants for an email to win a sweepstakes prize. Keep your budget in mind, too. 22. Make your contest brand related - One of the goals of your contest is likely to increase awareness about your business - i.e. market it. Make sure your contest is branded. Keep the prize brand related. Keep the theme brand related. 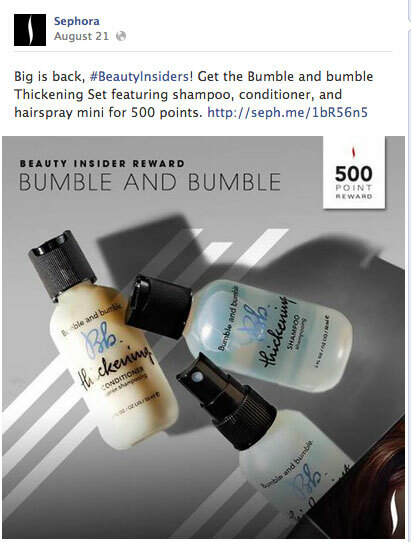 Here’s 10 examples of excellent branded Facebook contests. 23. Determine your contest time frame - How long will you run your contest? This will vary from one contest goal to the next. If you want a quick call-to-action from people, keep the time frame shorter, at one week. If you are running a big budget contest, and are using the contest as a way to promote a product launch, or have a significant giveaway, you’ll want to run the contest for a longer time frame, such as a month. 24. Determine contest frequency - How often you run contests is related to how long they are. I’ve seen tons of success from businesses who run successive week long contests. 25. Determine entry methods - Before you start to build your contest, decide on the entry method for your contestants. Will you “Like-gate” your contest - that is, do people have to Like your Facebook Page before they can enter? Do they have to give you their email? Can they also enter via email, if they don’t have a Facebook account? Base your entry method on your goals, objectives and target market. 26. Determine guidelines - Yup, guidelines are generally a part of any type of contest. First of all, make sure you are adhering to Facebook contest guidelines. Then determine your contest guidelines. Are you asking for UGC like photos or videos? Do you want to use these for future promotional purposes? What are your rules and regulations about this - to get lots of entrants, but still obtain your objectives. 27. Sort out logistics - Is your contest open to anyone in the world? Have you thought about how you’ll ship a prize anywhere? Do you need to set this up before you start? 28. Sort out your measuring tools - Get your measuring tools ready before you begin your campaign. This will give you a baseline from which to show your results. Are you just measuring social success? Do you only need Facebook Insights? Are you measuring deeper consumer success, such as repeat entrants? You might need tools such as Wishpond’s Social Marketing Suite. Are you measuring sales? What company tools will you use to monitor this success? 31. 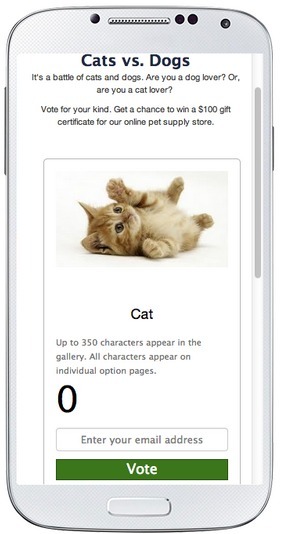 Use an app - Yes, it’s now legal to run simple contests on Facebook - without a third party app. This is great news for many small businesses (as many had been using these types of contests anyway - at the risk of being shut down!). I’d still suggest that you use a third party app. It makes it so much easier to manage. It makes your contest (and business) look more sophisticated. It takes about five minutes to set up a contest. You get real-time analytics, customer management tools, and even the option to run contests through other social sites like Twitter or your website. It’s your choice, of course. Try with and without an app, and see which you prefer. 32. Make an attention-grabbing title - Write out a short, catchy title with a simple Call-to-Action (CTA). Include your prize, your business name, and ‘win’. 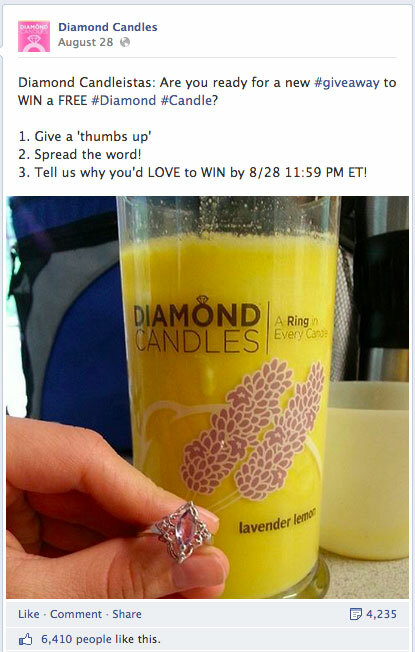 For example, “Enter to Win a $50 Gift Card from Diamond Candles”. 33. Include a contest hashtag - If your are hosting your contest on Facebook, include a contest specific hashtag to extend the reach of your contest. 34. Make a description of your contest - Keep your contest description short and clear, with simple CTA’s. Here’s a great example from Diamond Candles. They use a question in their Facebook post, and have simple, clear CTA’s. They use hashtags too, to get their post seen by people looking for giveaways on Facebook. Their prizes (candles with hidden rings) are visually appealing too. 35. Write about your prize - Include an enticing description about your prize. Make it clear and obvious why your market would want to win. 36. Create an appealing visual of your prize - Include a great photo or graphic of your giveaway. If you have more than one prize, include your grand prize in your contest graphic. 37. Describe how to enter - Clearly tell (or show) how to enter your contest. The easier you make it, the more contestants you will get. Through Wishpond’s apps, you can have contestants enter directly through Facebook, or through email and Facebook. 38. Describe entry requirements - If entrants just have give you their email, make this clear. If you’re asking for a video, be clear about the guidelines for it. 39. Include details about your contest rules - Make sure you dot your i’s and cross your t’s - include your contest rules and regulations. 40. Include rules about UGC - If you want to use the content for later promotional purposes, make it clear, so people give you their permission. 41. Include details about how a winner will be chosen - This is particularly important if you are choosing the winner via a vote. If it is clear that the entry with the most votes gets the win, more people will do everything they can to get your contest (and their entry) shared! 42. Choose the Facebook Page you’re running your contest on - On a third party app, like Wishpond, you can run contests on multiple Facebook Page you administer. 43. Choose to share - With a third party app, like Wishpond, you can choose to automate a post to the contestants Facebook Wall (or Twitter feed) when they enter. This spreads the word about your contest to their friends. 44. Choose your language - Wishpond apps let your choose from 44 languages to run your contest in. 45. Create a customized banner - Wishpond lets you easily import a customized banner to display on your Facebook contest. Make it enticing, showing your prize, or how happy you’ll be to win! 46. Customize your Facebook contest tab, and landing page - Create a customized contest app icon for your Page. Make it visually appealing, and brand specific. 47. Customize your entry form - You can customize your entry form to make it more brand specific and appealing to your market. 48. Make a “like-gated” graphic - If you’ve like-gated your contest, change your Facebook cover to show a clear CTA on how to ‘like’ your Page to enter your contest. 49. Set your dates - Set up your contest dates. If you’re voting too, set up the dates for when voting starts and ends. 50. Preview your contest - Before your contest goes live, make sure you preview it - in both desktop and mobile! Before your contest goes live, plan out your marketing tactics for your campaign. I’ve seen a lot of businesses build a great contest, with a fitting prize and everything else. Then their contest dismally disappoints. Why? They didn’t promote it well. 51. Use email pre-contest - Send out an email blast a day or two before your contest starts. Build anticipation with your contacts. 52. Use email when your contest starts - Send out a second email when your contest starts to invite your contacts to participate. 53. Cross-promote it to social sites - Use your Twitter, Instagram, Pinterest, Google+ and any other social sites you have. Post updates about your contest, with a direct link to your Facebook Page. 54. Highlight a Facebook post about it* -* Keep your contest post at the top of your Facebook Page by highlighting it. 55. Update your contest status - Post more than once about your contest on your Facebook Page, to keep it being seen in your Fans news feeds. 56. 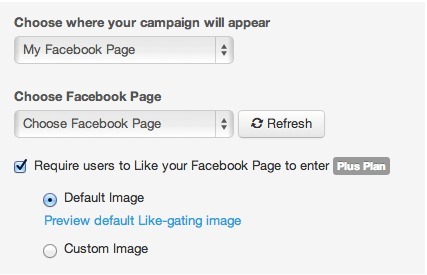 Use a campaign hashtag - Create a campaign specific hashtag to use on Facebook and other social sites. This can get other people using your tag too, and increase awareness of your contest. For example, Sephora uses campaign specific hashtags for discounts and group contests. 57. Use general hashtags - Include a few general hashtags in your social posts to spread the word about your contest beyond just your fans and followers. 58. Use Facebook Promoted posts - Pay to promote your best Facebook post about your contest. Here are tips on using Promoted posts. 59. Use other Facebook ads - Pay to get your contest promotion seen by more of your Fans, and others in the targeted demographic you need to reach. 60. Use Google ads - Set a budget, and promote your contest beyond Facebook. Use Google ads to target your market. 61. Use Twitter ads - Use Promoted Tweets to extend the reach of your contest updates. 62. Place ads on niche websites - Run ads with popular niche sites, that are visited by your target market. For example, if you’re targeting new moms, place ads on popular ‘mommy blogging’ sites. 63. Put a banner on your website - Be sure to promote your contest on your website. Upload a good banner to your homepage, so your web visitors can link directly to your Facebook campaign. 64. Blog about your contest - Write something about your contest on your website blog, include a direct link to your contest to make it easy to enter. 65. Include it in your e-letter - Do you send out regular e-letters? Invite your subscribers to take part. 66. Try earned media through a press release - Most business miss out on this opportunity, but try writing a short press release about your contest. Make it sound innovative and something your local or niche media would be interested in. Pitch it to the press, and you may get free printed coverage. Here are tips to writing a press release to promote your Facebook contest. 67. Partner with other businesses - If you are giving away a product from another business, partner with them in your marketing efforts - get them to mention your contest on their social sites too. 68. List your contest on popular contest sites - There are lots of websites dedicated solely to posting new online contests. Find ones that suit your contest and post your info on them. Here’s 19 popular contesting websites. 69. Get contestants to promote - Include a voting element in your contest, with the person with most votes winning. Exponentially promote, by getting participants to share your contest for you! 70. Promote your contest offline - Include your contest info in your printed marketing materials. Use QR codes so people can easily scan their phones and be directly connected to your contest. Here’s a list of 10 KPI’s (key performance indicators) you could measure (based on your goals and objectives). 81. Use Facebook Insights - Monitor Facebook updates about your contest through Facebook Insights. You can track the number of shares, likes and comments your contests posts receive, and the number of new Fans your Page received during the run of your contest. 82. Use Facebook Ads Manager - If you’re promoting your contest through Facebook ads, use the analytics in Ads Manager to monitor your paid promotions in real time. Adjust your ad copy and targets to improve on your achievements. 83. Use Google Alerts - Monitor your company, product and campaign mentions by setting up Google Alerts. 84. Use Google Analytics - If you’re running Google ads, make sure you monitor results, and tweak the ads as needed. Do A/B testing, reword your copy or change your targets. 85. Use Twitter analytics - Monitor your tweets about your contest, and any ads you’re running on the platform. 86. Use third party app analytics - Here’s another massive benefit to using a third party contest app. Use the application’s analytics to easily monitor your contest. Wishpond’s Social Marketing Suite, for example, gives you comprehensive real time analytics to monitor your entrants, collect emails, view potential reach and more. 87. Monitor your sales - Use your business sales tracking system to measure any increase in sales. 88. eCommerce insights - Track visitors to your website, using the backend analytics on your site - your analytics will vary if you have a Wordpress site, an Etsy store, a Shopify site, an Ebay store, etc. 89. Improve your marketing campaigns - Based on your real time results, tweak your ads and other promotional methods. For example, send out a second email blast to market your contest, and measure the results. 90. Tweak your contest - If you need to get better contest results, add better CTA’s in your title, add simple keywords to describe your Facebook contest, or update it with better visuals of your prize. When your Facebook contest has finished, your marketing work has not ended. Now’s the perfect time to further develop relationships with your participants and gain more potential customers. Here are 10 ways to follow-up after your contest is done. 91. Choose a winner, and notify them - Whether you’ve made your contest win based on a random draw, a panel of judges, or through public voting - choose your winner(s), and let them know they’ve won. Email them, and tell them how to get their prize. 92. Take a photo or video of the winner - If you are geographically close, meet the winner in person and take a photo of them receiving your prize. 93. Congratulate the winner(s) on Facebook - Mention your winners name in a Facebook update. This makes the winner feel special, and shows your other entrants that somebody won. Include the photo or video. 94. Congratulate the winner(s) on your other social sites - Mention the winner (by name or not) on Twitter, Instagram, Pinterest, Google+, LinkedIn and your other social sites. This gives you one more opportunity to share your contest to all your social contacts. 95. Make a blog post on your website - Write a short blog post on your website to congratulate the winner(s). 96. Place ads to congratulate the winner and thank participants - Make an ad on your social sites to thank all of your participants and congratulate the winning entry. 97. If you got UGC - showcase the winner(s) - Use your new photos, videos and essays and post them on your social sites and website. 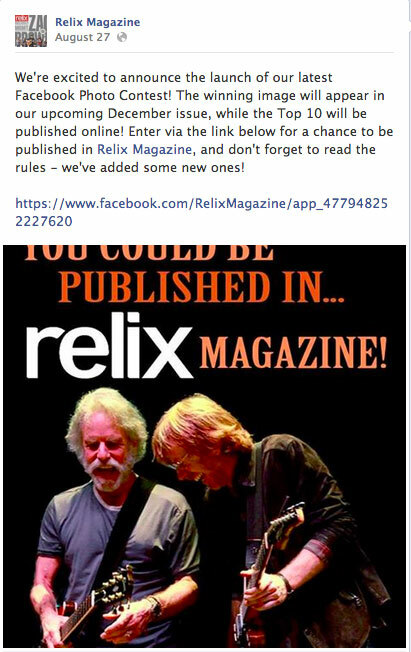 Relix magazine takes this one step further. They showcase winners of their Facebook photo contests in their printed magazines. And publish the top 10 online. 98. If you got UGC - showcase the runners’ up - Take the opportunity to show you value the work of lots of participants. Post some of the non-winning entries on your Facebook Page, website and other social sites. 99. Send a follow-up email - Send an email to all of your participants. Thank them for participating in your contest. You could even offer everyone a small discount just for participating. 100. Invite your participants to your next contest - When you send out the follow-up email, be sure to invite your participants to take part in your upcoming contest. Also, tell them about any other specials or new products your business has. 101. Run Facebook contests regularly - Repeat your contests, tweaking as you go. Run your contests every week, for example. This builds habits in your consumers, and momentum for your contests. So, there’s 101 tips to make your next Facebook contest a success. Try out a few, or try them all. See how far Facebook contests can take your social media marketing for your business! And, uh, do you think these ideas are great, but just a little too overwhelming to do on your own? Don’t worry, we can help. Check out our VIP Demo, and get a free 30 minute consultation with our team. What do you think? What additional tips have you learned? What’s your most successful Facebook campaign?